April TICUA eNews: Executive Leadership Institute, Waller Update, & More! The TICUA Executive Leadership Institute(ELI) is an innovative leadership development program for those senior campus leaders who seek to strengthen their current and future roles within their institution and who may be considering a college or university presidency. The program not only strives to provide the leadership with knowledge and skills necessary to prepare senior campus officials for the presidency but more importantly, is designed to strengthen the local campus’ leadership team. and, to explore solutions to campus-specific questions, problems, issues, or challenges utilizing data-driven decision-making. 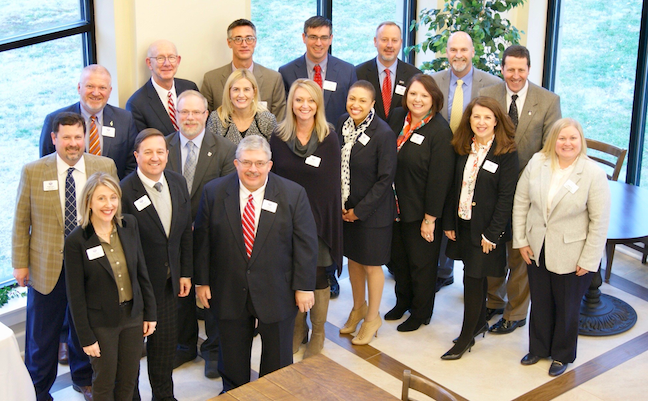 The Institute opened its doors to the inaugural class in 2016-17, hosting 17 Pressnell Fellows – with one of those Fellows ascending to the presidency of Johnson University in 2018 and another serving as interim president of Martin Methodist University. The 17 members of the 2017-18 Class also saw one of its members serve as interim president of Carson-Newman University. Combined, these 34 Pressnell Fellows visited 19 TICUA member campuses and learned from 36 sitting presidents as well as other content experts. To date, the 21 Pressnell Fellows of the 2018-19 Class have visited Vanderbilt, Southern Adventist, Cumberland, Aquinas, Freed-Hardeman (Dickson campus), and Johnson. The Fellows have explored institutional governance, educational policy and politics, strategic planning, friend- and fund-raising, public relations, internal and external communications, enrollment management, academics and faculty relations, and financial management. While exploring these topics, the Fellows have met and learned from eight current TICUA member presidents, two presidents emeriti, and numerous senior members of TICUA member campuses.The 2018-19 Pressnell Fellows also attended the TICUA Annual Meeting and then met with attorneys from Waller Law focusing on legal issues affecting private higher education. In April and May, respectively, the Fellows will visit the Southern College of Optometry, Watkins College of Art and Design, and Trevecca Nazarene University. While at Southern College of Optometry in April, President Lewis Reich will serve as Residential Dean while Dr. Betty Sue McGarvey, president of Baptist College of Health Sciences, Darryl McGee, vice president for student affairs and chief budget officer of Lane College, and Dr. Brian Carrier, vice president of student life and dean of students of Union University, will serve as content faculty focusing on the area of student affairs. In May, Fellows will visit Watkins with President J. Kline serving as Residential Dean. In addition, the following TICUA member presidents will join Dr. Kline, as content faculty for the “transitioning to the presidency” session: Dr. Kevin Rome (Fisk), Dr. Harley Knowles (Tennessee Wesleyan), and Dr. Dan Boone (Trevecca). Also serving will be Dr. Alisa White, president of Austin Peay State University and Lee University alumnus. Dr. John Smarrelli, president of Christian Brothers University and TICUA Board chair, Dr. Dan Boone, president of Trevecca Nazarene University, and Dr. Claude Pressnell, president of TICUA, will host the 2019 ELI graduation at Trevecca. TICUA is asking that member presidents submit their 2019-20 ELI Pressnell Fellow’s selection form by Friday, May 3rd. To learn more about ELI, please contact Dr. Diane Berty at berty@ticua.org or 615-242-5400 x203. The salary threshold for employees exempted from the FLSA under the highly compensated employee exemption would increase from the current $100,000 per year threshold to $147,414 per year. The DOL's News Release can be found here. As many no doubt recall, the DOL under the Obama administration finalized an overtime rule that was set to raise the salary threshold for the white-collar exemptions to $47,476, only to have it enjoined by a federal court in Texas. That litigation percolated through federal courts until the change in presidential administrations. Unlike the Obama administration's proposed rule, the current proposed overtime rule will not automatically adjust the salary threshold to match an economic benchmark. Instead, the current proposed rule would call for periodic reviews and adjustments through additional rule making. The DOL has not yet published the full proposed rule. Once it does so, the 60-day public comment period will begin, and only thereafter is the proposed rule ripe to be implemented by the DOL. Given these procedural steps, the earliest an increased salary threshold will likely take effect is the latter part of this year. Click here to read the full update. If you have suggestions for future Legal Notes, please contact Dr. Claude Pressnell (pressnell@ticua.org) or Jeb Gerth (jeb.gerth@wallerlaw.com). Registration is open for our upcoming Membership Meeting slated for April 12, 2019. This meeting will take place via statewide webinar. Ohio State University will be sharing information about the College Prescription Drug Study. For more information and to register, click here. Registration is open for the 2019 Partners in Prevention Conference! This year's theme isBeen There; Done That: New Approaches to Old Problems and the event will be held at Trevecca Nazarene University May 22- 23, 2019. To register, CHASCo members will need to use the promotional code: CHASCOFREE. Visit the PIP website for more information and to register. The Baxter Award recognizes and individual in the state who has volunteered his or her time and energy to achieve positive results in the area of alcohol and other drug and violence prevention. We are currently taking nominations for this award. Please consider nominating someone you think is worthy of recognition in this area. Nomination submissions are due by April 11, 2019. Click here to submit nominations.